The Dr. Clifton & Lois Dummett Scholarship is named in honor of Dr. Clifton O. Dummett, (May 20, 1919 – September 7, 2011). Dr. Clifton O. Dummett, Distinguished Professor Emeritus of the Herman Ostrow School of Dentistry of the University of Southern California, studied at Howard and Roosevelt Universities before earning his Doctor of Dental Surgery (DDS) from Northwestern University in 1941. He earned master’s degrees in periodontics and public health from Northwestern and the University of Michigan, respectively. In 1947, Dummett was named dean of the School of Dentistry at Meharry Medical College, where he was the youngest dean in the United States at 28. An advocate for social justice and equality for all people, it was Dummett’s resolution in the American Dental Association (ADA) House of Delegates that led to the lifting of restrictive membership within the organization. He served the National Dental Association (NDA) for 22 years as editor in chief. 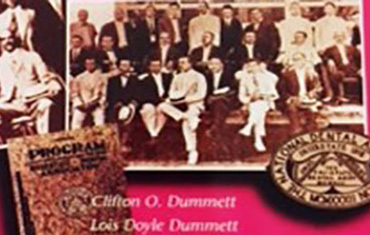 He and his wife, Lois Doyle Dummett wrote “NDA II: The Story of America’s Second National Dental Association”, published by the NDA Foundation, in 2000. An internationally acclaimed author and researcher, and humanitarian, Dr. Dummett wrote hundreds of articles on dental history, public health issues, and social and community issues.